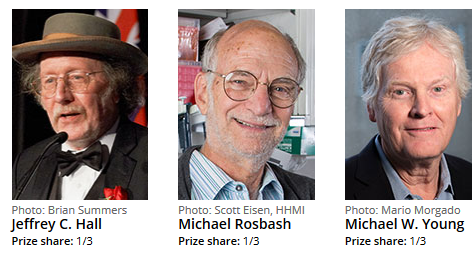 …was awarded to Jeffrey C. Hall, Michael Rosbash and Michael W. Young "for their discoveries of molecular mechanisms controlling the circadian rhythm". Life on the Earth is harmonized with its rotation. We know that living organisms have an interior biological clock. It helps them prepare and adapt for the usual daily rhythm. But how do circadian rhythms and biological clock really work? The scientists managed to glance at our biological clock. Their findings clarify how humans, animals and plants adapt their biological rhythm in such a way that it gets synchronized with the Earth's rotations. To be precise, our interior clock is responsible for adapting our physiology to different periods of the day. Our inner clock regulates a number of critical functions such as metabolism, behavior, sleep, hormone levels, body temperature and s.o. Therefore, chronic misalignment between the rhythm that is dictated by our internal timekeeper and our lifestyle is correlated with incremented risk for different diseases. Our biological clock is engaged in various aspects of the complexity of our physiology. All the multicellular organisms apply analogous mechanism to control their circadian rhythms. A broad percentage of our genes are controlled by our biological clock. Therefore, thoroughly tuned circadian rhythms adapt our physiology to different day phases. 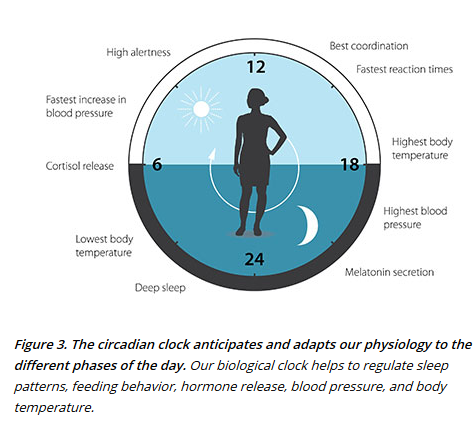 Circadian biology is now a highly dynamic investigation field, with further implications for our health and well-being.